You don’t need to have learned how to play a musical instrument before you play AereA, but it might help. It’s a new action-RPG with a music theme. What that means is its knight isn’t your regular steel-armored chap – they’re a Cello-Knight. There’s also a Harp-Archer, a Lute-Mage, and Trumpet-Gunner. This really is a band of adventurers. Whether you’re rocking by yourself alongside three AI companions, or have invited friends round for up to four-player co-op, your goal in AereA is the same. The idea is to explore a floating island called Aezir that has been broken into several pieces. Your mission is to find the the nine primordial instruments to restore balance to the world. You can expect to encounter a range of challenges along the way: quests, puzzles, and big bosses to battle for starters. Success will grant you a new piece of information about Aezir, unveiling its secrets, leading you to perhaps find out what threw it into disarray into the first place. AereA is the first in a planned series of games that take place in this universe so if you’re into your lore then you’ll want to dive right into this one, and can expect years of storylines to keep you intrigued. 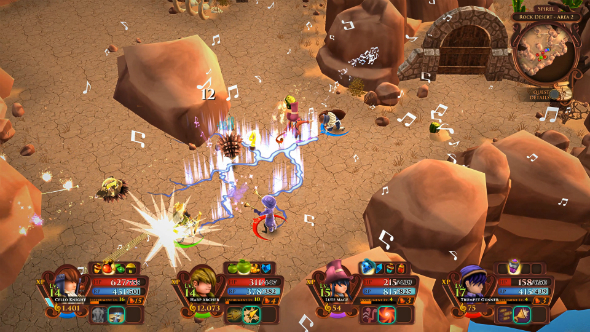 Now, no doubt you want to find out how you can win a copy of this musical action-RPG, huh? All you need to do is enter via our widget below. Every action you complete is worth one entry into the giveaway, and the more actions you complete the more chance you’ll have of winning. We’ll also need your email address so we can send you a code upon winning – we won’t send you spam, we promise! If you enjoy our giveaways then drop us a Like on the PCGamesN Facebook page or follow us on Twitter to stay in the loop with all out future giveaways.